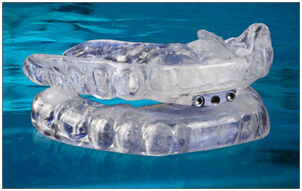 A snore guard is an oral appliance that is worn while you sleep in order to prevent snoring. Dr. Bowen and Dr. Gehlert create custom fitted snore guards to eliminate or greatly reduce snoring so you can and your spouse can sleep comfortably. Snore guards shift your jaw position slightly forward to provide a clear airway in order to reduce snoring and improve breathing. Obstructive sleep apnea is a serious medical problem that occurs when the airway completely collapses and blocks airway to the lungs. The airway remains closed until the brain partially awakens the person which loosens the jaw returning the tongue and throat back to a normal position to restore airflow. This cycle repeats itself 50 times per hour during the night. Sleep apnea is associate with serious health risks ranging from heart problems, high blood pressure, etc. Wearing a snore guard prevents snoring and sleep apnea health risks.